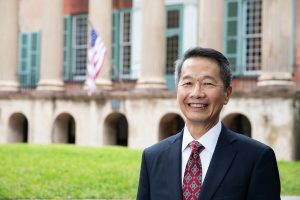 The College of Charleston’s Board of Trustees voted unanimously Wednesday, Nov. 28, 2018, to elect Andrew T. Hsu as the 23rd president of the university. Hsu will succeed Interim President Stephen C. Osborne ’73, who took on the role of interim president July 1, 2018, following the retirement of Glenn F. McConnell ’69. His start date has not been determined yet. RELATED: Read Board Chair David Hay’s full message announcing the new president. 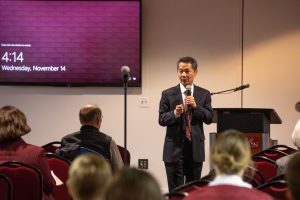 Hsu (pronounced “shoe”) is currently the provost and executive vice president for academic affairs at The University of Toledo in Toledo, Ohio, where he has led a series of initiatives aimed at enhancing academic excellence and student success. For Hsu, an immigrant from China, taking the helm of the oldest university south of Virginia is the embodiment of the American dream. He will become the first person of color in the College’s 248-year history to serve as president. 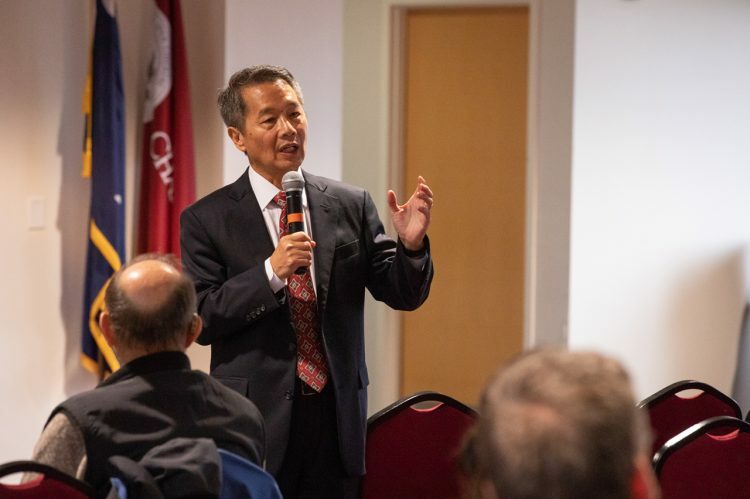 Hsu’s ascension to the upper echelon of higher education is particularly poignant because of his difficult childhood during the Cultural Revolution in China. Amid the turmoil, Hsu was denied an early education, something that shaped his appreciation for learning – specifically a liberal arts education. Since joining The University of Toledo in 2016, Hsu has led the university through a strategic planning process, including initiatives to improve student retention and graduation. Through a campus-wide effort, the strategic plan implementation has resulted in significant progress in student success, research and scholarly activities, and fundraising: The university has improved its first-year retention rate by more than 10 percent and graduation rate by 5.5 percent, and research awards and fundraising at The University of Toledo are both up by 20 percent. Prior to his post in Toledo, Hsu served as the dean of engineering at San Jose State University from 2013 to 2016 and as the associate vice president for research and the dean of the Graduate School at Wright State University from 2010 to 2013. RELATED: Learn more about President-Elect Andrew T. Hsu. Board of Trustees Chair David Hay notifies Andrew T. Hsu by phone that Hsu has just been elected the 23rd president of the College of Charleston. 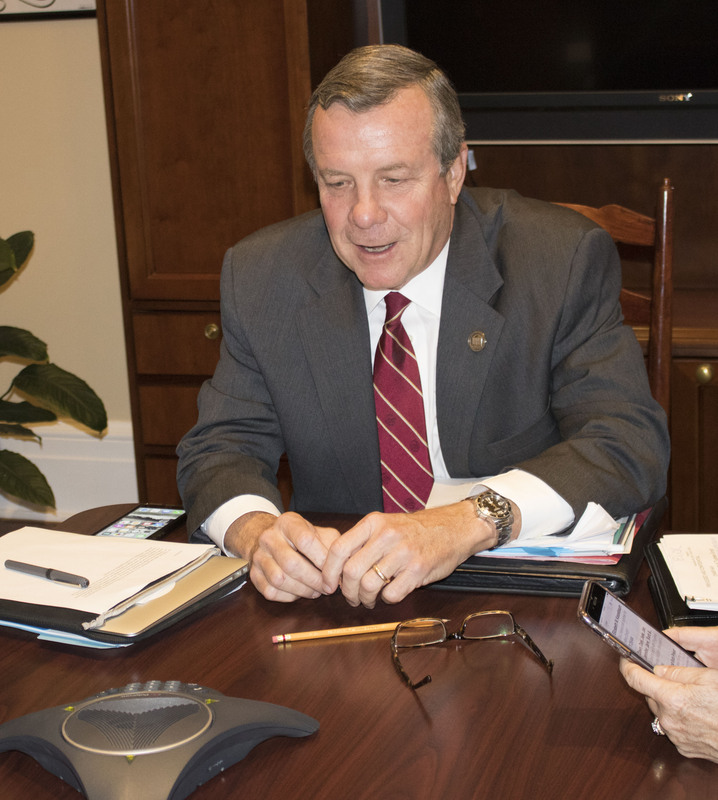 The College’s Board of Trustees, with assistance from the search firm of R. William Funk and Associates, launched a national search in February 2018 for the College’s next leader. Hsu rose to the top from a pool of more than 130 applicants. Hsu said he was attracted to the College because of its long history and rich tradition of providing a high-quality liberal arts education. President-Elect Andrew T. Hsu talks with faculty, staff and students during a campus forum earlier this month. During his visit to campus as a finalist earlier this month, Hsu was impressed with the College’s seamless blend of historic buildings along with impressive, modern facilities. He said he was particularly impressed by the faculty’s commitment to academic excellence and the students’ excitement for learning. Hsu graduated from Tsinghua University in Beijing, China. He then came to the United States where he earned a master’s degree from the Georgia Institute of Technology before completing his doctoral degree in aerospace engineering at Georgia Tech in 1986. He then worked in industry for 11 years with Sverdrup/NASA and Rolls Royce, where he developed unique industry perspectives and leadership skills. Hsu joined academia in 1997 as an associate professor of mechanical engineering and director of the aerospace program at the University of Miami. Hsu and his wife, Rongrong Chen, have four daughters, Carol, Kristie, Jenny and Emma. As someone who appreciates the transformative power of education for students and the community, Hsu said he celebrates the College’s rich educational traditions and wants to help lead the institution to the next level of excellence in its long history.